"Nobody's talkin… and I don't blame them." Lionsgate Premiere has debuted the official US trailer for the procedural action thriller Exposed, starring Keanu Reeves as a detective searching for the truth behind his partner's killing. We ran an international trailer for this a few weeks ago, and this new version is the official US launch, but it doesn't look that much better. Aside from Reeves, Exposed stars Ana de Armas, Mira Sorvino, Christopher McDonald and Laura Gómez. It's not that this looks bad, there's just not much going on. The big crime mystery seems bland and boring, but maybe that's me. I am still a Keanu fan. After witnessing a miracle, a young Latina woman (Ana de Armas) experiences strange things as a police detective searches for the truth behind his partner's death. Starring Keanu Reeves as Detective Scott Galban. 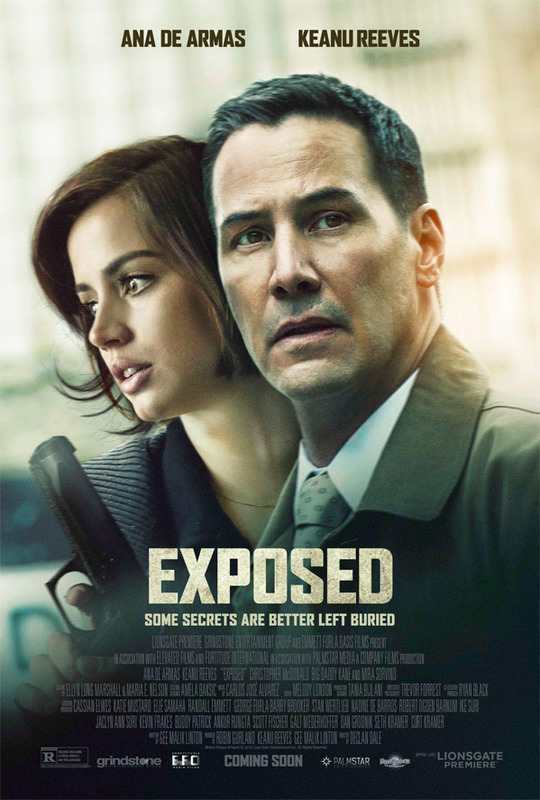 Exposed (Some Cases Are Best Left Unsolved), with alternate titles including Daughters of God or Wisdom, is both written and directed by first-time feature filmmaker Gee Malik Linton, a former physical trainer who directed a short back in 2001. Lionsgate Premiere will be releasing Exposed under that title here in the US in theaters + VOD starting December 22nd, 2015, for those interested in this. Your thoughts? Woah. This does not look like a good time. Reeves looks so much different than JOHN WICK. Is it just the weight gain? Still looks like Segal-level entertainment. Seagull style movies are never a good time, unless it's 3am and you have watched all there is on tv. LOL...There's a time and a place. As they say. I loved them when i was 12 for sure. The invincible Seagull was amazing. Ana De Armas with Keanu again? Yes plese. I fell in love with her in "Knock Knock"! It didn't mater that she was playing a psycho.